This is an extremely handy cart. I'm not sure that for the price is worth the value however. There are many items that are similar in sturdiness for a lot less. It's not bad, but shop around before you settle on this one. Offer a sturdy and reliable place for storage in your home with this useful metal cart. The three shelves bear up necessities with ease, and two locking casters ensure the cart stays in place. Whether you use it for books and magazines in your living room, dishes and food in the kitchen, or tools in your garage, the cart is versatile enough for any storage task. I ordered this cart so that I could purpose it as a bar cart. It's a bit smaller than what I thought, but it's still cute and can serve multiple functions in the home. When I was assembling the pieces, I noticed that one of the shelves wasn't screwing into the legs properly- the screw couldn't reach far enough into the shelf to secure it. I reached out to Overstock support and they sent me a brand new cart, instructing me to use what pieces I needed and send back the rest rather than just sending me the shelf on its own. I received my new replacement package promptly within a week. I took out the first shelf of the new cart and noticed it had a dent in the side. Good thing there were two more shelves in the package! However, the second shelf I pulled out ALSO had a dent in it! I prayed that the third shelf would be undamaged, and thankfully it was fine. I screwed it into my cart without issue. Considering I was sent two separate carts and 3 out of the 6 shelves were damaged, my experience really brings into question the quality of the product and the actual value of it. In the end, if you receive this cart without any damage or issues, you should be satisfied with the product- just don't expect anything high-quality. Cons: First one had scratches in the paint, dents, poor welding and two right side panels. I returned for a replacement, hoping the first one was a fluke. The replacement came with chipped paint, poor welding, and poor packaging by the manufacturer, which left lots of sticky residue from the tape stuck to the metal instead of the plastic. Very disappointed in the item, so returned for a full refund. Pros: The color teal was a fantastic shade! The wheels for mobility, a great idea. Customer service both times I called in were incredibly sincere and super efficient in processing my requests. Still love Overstock, have been a happy customer for many, many years and will continue. I purchased this utility cart for storage next to my front door. I placed baskets on two shelves for a pet leash and supplies. Works well in a small space. I was looking for something to put into a closet under the stairs. This is perfect!! It was very easy to put together by myself. It's very sturdy and the casters roll nicely. The bar along the back, makes it so that items stay on the shelf. Size is perfect and I love the teal!!! Easy assembly. Directions were easy to follow and it came with the tools for the assembly. The color is nice and it's a sturdy shelf. The size is small for a rolling cart. One would have to bend over to push it-- if that's how you are wanting to use it. Mine is staying stationary next to my wine rack, so it works well for my space. I like my cart. I needed something to fit between my cupboard and stove and this fit perfectly and I was happy that they had it in the color that my kitchen is designed around..red. I like that it has the locking wheels. You can lock it when not moving it and when you want to clean you can just wheel it out. Makes cleaning easy. I love having the shelves. You can always use extra shelving in a kitchen. It is sturdy yet light. I am very happy with it. I ended up using this somewhere other than where I planned, it was not as big as I had anticipated and spacing of shelves is fixed and just did not work as planned, but makes a nice spare storage shelf for small items, I use mine for my cpap and bedroom necessities. Cute, good color selection, good quality, easy to assemble. Perfectly modern utility cart on casters. Can be attractive and useful in any room. Size is just right for my apartment, and I quickly put it together all by myself with the included tools. In order to stay straight and level, DO NOT tighten each screw individually, but move around the cart tightening each screw a little bit at a time until all are tight; that’s what worked for me. Love this shelf. Expect it to last years since it is metal. Its the right size to put anywhere in the house to store medium- large weight items. I have mine in the bathroom. i originally got this to use as a bar as pictured in the product but its way too small and stands short to do that. I've moved it over by my door and using it as entry way stand. This was exactly what I was looking for to store items in my kitchen. It was a cinch to assemble. I chose to leave the rollers off, since I would keep it stationary, and am delighted. This cart is so cute and colorful - just the right size very easy to assemble did it myself!!! This is nice but a lot smaller than I thought. I admit to not pulling the tape measure out and checking before ordering, but it is a lot smaller than the pictures make it look. The top shelf holds 12 books standing. I purchased this for an Assisted LIving Home's library for "new releases" but it is so low they have to bend way down. Just check the measurements before you buy. Otherwise it is a sturdy little cart. and this time I really looked at the dimensions and measured them out. It was very cute, perfect size for a kids room or other small need. The whole cart was a little wobbly with and without the casters. Great color. Great value for the price. Sturdy and easy to move. I recommend m shipped fast , I applied the 20% coupon, was easy to assemble, it is light weight , but sturdy, I am thinking of getting a second unit . It turned out to be exactly what I'd been looking and it was very easy to assemble. I used some things I already had to complete the look; the baskets on the second shelf will be filled with more produce. I chose to not put on the wheels, because I don't need it to be mobile, but I may still add them because I think maybe a little height would be a good thing. I love this cart! So glad I bought 2!! It is a great size and color! One is On each side of the new kitchen island and it makes life so much easier!! Well worth the price! Looks good and perfect for small spaces. 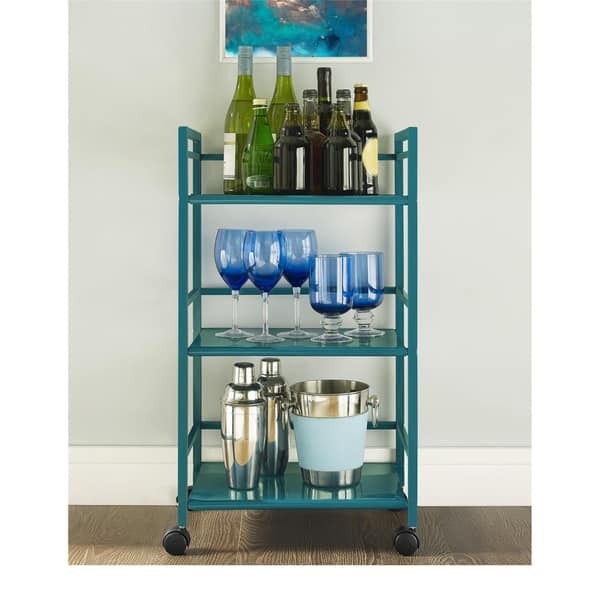 "I'm wanting this utility (bar) cart in red Thank U "
Overstock may not have this item in red. Use the search function on website. However, I have seen this cart in red at other big box stores. Use Google if you can't find it on Overstock. "What are the dimensions? The specs are cut off, I can't see them in the description." "What is the weight capacity for each shelf?" I would think that 18-20 pounds would be it, Not wide enough for much, we have laundry supplies on ours and that works fine. "Will it be safe to use a small toaster oven that will heat up? I would put it on the top shelf of this utility cart and it fits on the dimensions stated. The weight is12 lbs so the weight is ok as stated also- Thank you very much"
I don't really know how the paint would hold up to the heat because I've never owned a toaster oven. I know it would be strong enough to hold it. I like this shelf set so much I have bought 3, but I am using them for my quilting supplies. I use mine for my paraffin machine that maintains a warm heat 24/7. It is a very solid piece, my advice is to make sure you have plenty of space and ventilation around it, monitor it and if any excess heat becomes present, discontinue using it. "Is this large enough to hold a microwave?" No it is not big enough for a microwave. Not it's not, I bought it to have my printer on the shelf, but the shelf is not wide enough. "Is the overall height to the top of the rail or to the top shelf? What is the height distance between shelves Thank you"
Hello armandsimone, the overall height is from the top of the cart to the bottom. The height from the floor to the bottom shelf is approximately 3.27 inches, from the bottom shelf to the middle shelf is approximately 10 inches and from the middle shelf to the top is approximately 10 inches. Thanks for shopping with us! Hello lparis402, the wheels are removable. Thank you for shopping with us. A fashionable bar cart is a must-have for any hostess who loves entertaining guests. Here's how to style a bar cart to be the focal point of your gathering. Kitchen Island Buying Guide from Overstock.com. Our guides provide customers with information about kitchen islands.